Visitors to Ocracoke Island make the lighthouse a must-see stop on their walking and biking tours throughout the village. Because everything is so close, finding and visiting the Ocracoke Lighthouse is a breeze once you're on island. In fact, an Ocracoke day trip and walking tour is typically a must on seasoned vacationers' to-do lists, as the entire excursion, from the fun 40-minute ferry ride across Hatteras Inlet to the multitude of quaint yet quirky shops and restaurants to explore once you've arrived, is pure Outer Banks entertainment for the entire family. The Ocracoke Island Lighthouse is unique in that it is not open to climbers, and does not have a gift shop, museum, or information center on site. However, visitors are still encouraged to stop and explore, and take photos of the lighthouse and historic keepers' quarters tucked behind a cluster of Live Oaks. Parking is limited compared to the other Outer Banks lighthouses, however a long line of bike racks is available for use. Like most of Ocracoke Island, exploring is at its best for bikers and walkers who can leisurely peruse the grounds at their own pace, and a number of local gift shops feature plenty of Ocracoke Island Lighthouse books, memorabilia and souvenirs. Many vacationers make it a point to start at the Northern Outer Banks' Currituck Beach Lighthouse and enjoy a long but rewarding day driving south down the scenic North Carolina coastline and stopping at each lighthouse along the way. With their own distinctive character, notoriety, and charm, all of these historic lighthouses are certainly worth a visit during your next Outer Banks vacation. Where is the Ocracoke Island Lighthouse? The Ocracoke Lighthouse is located in Ocracoke village, on the southeastern corner of the Ocracoke Harbor. It is situated along the aptly named Lighthouse Road, and is visible throughout Ocracoke village. When was the Ocracoke Island Lighthouse built? The Ocracoke Island lighthouse was built by a Massachusetts-based builder, Noah Porter, in 1823. As such, it is the oldest operating lighthouse in the state of North Carolina, and the second oldest lighthouse of any kind in the state as well – second only to the Bald Head Island Lighthouse. Do you need to take a ferry to see the Ocracoke Lighthouse? To see the Ocracoke Island lighthouse in person, visitors will need to take a ferry to Ocracoke Island. Vehicular ferries depart from mainland North Carolina to the southern end of Ocracoke village, and from Hatteras Island to the northern end of the island. How many steps are in the Ocracoke Island Lighthouse? The Ocracoke Lighthouse has just 86 steps from the lighthouse base to the 4th order Fresnel lens at the top. How do you get to the Ocracoke Island Lighthouse? 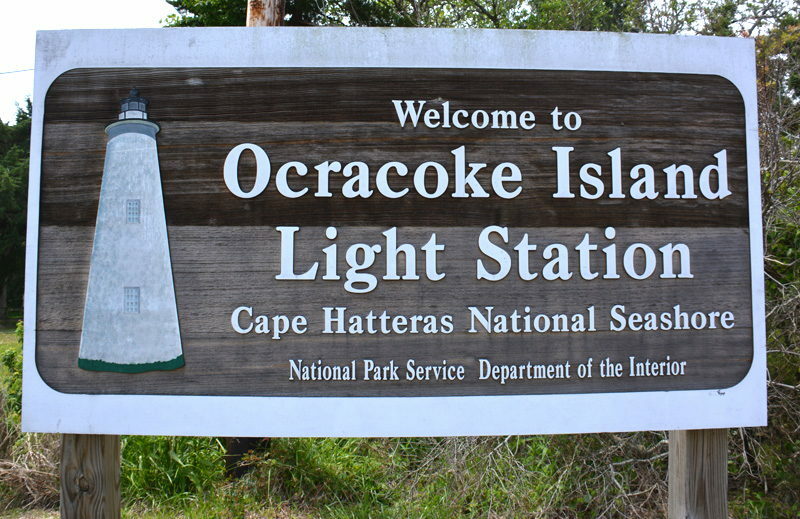 Visitors will need to take a ferry to reach Ocracoke Island, where the Ocracoke Island Lighthouse is found. Two vehicular ferries depart from the mainland communities of Cedar Island and Swan Quarter, which are both a roughly 2.5 hour ride away, and a faster hour-long vehicular ferry is also available in neighboring Hatteras Island, which is located just north of Ocracoke Island. Can you climb the Ocracoke Island Lighthouse? The Ocracoke Island Lighthouse is not open for climbing, however, visitors are welcome to visit the structure for photos. Why isn’t the Ocracoke Island Lighthouse open for climbing? 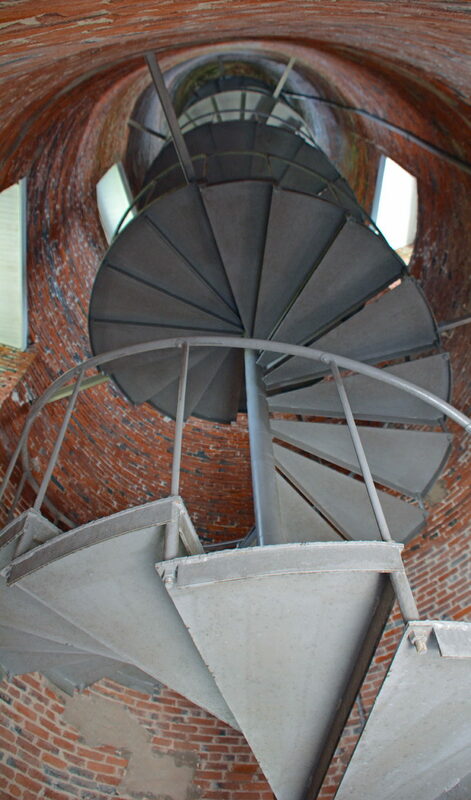 The Ocracoke Island lighthouse is not open for climbing due to safety concerns of the old structure, and particularly its spiral staircase. At nearly 200 years old, the Ocracoke Island Lighthouse is the second oldest lighthouse in the state. Why is the Ocracoke Island Lighthouse white? The Ocracoke Island Lighthouse is white due to its unique coating that was applied during its construction in the 1820s. The exterior “coat of paint” is comprised of lime, salt, ground rice, whiting, and clear glue, which was mixed with boiling water before it was applied to the brick exterior. As a result of this unique formula, it is the only white lighthouse on the Outer Banks. Where can you park at the Ocracoke Island Lighthouse? What is the best way to reach the Ocracoke Island Lighthouse? Because of limited parking and summertime crowds, seasonal visitors will likely want to walk or bike to the lighthouse from one of Ocracoke village’s main and central parking areas. Parking is available close to the Ocracoke Visitors Center and Ocracoke Preservation Museum, and the walk or bike ride from these parking lots to the Lighthouse is less than a mile. Why is the Ocracoke Island Lighthouse important? The Ocracoke Island Lighthouse is distinctive on the Outer Banks for its small size, and is notable in the state of North Carolina for its age. It’s the oldest lighthouse that is still in operation in the state, and the second oldest lighthouse of any kind in North Carolina as well. In addition, it is the only lighthouse on the Outer Banks to measure under 100’ ft. tall, and to be a stark white in color. Who owns the Ocracoke Island Lighthouse? The Ocracoke Island Lighthouse is owned and managed by the National Park Service, as it is a part of the Cape Hatteras National Seashore. Where can you stay near the Ocracoke Island Lighthouse? 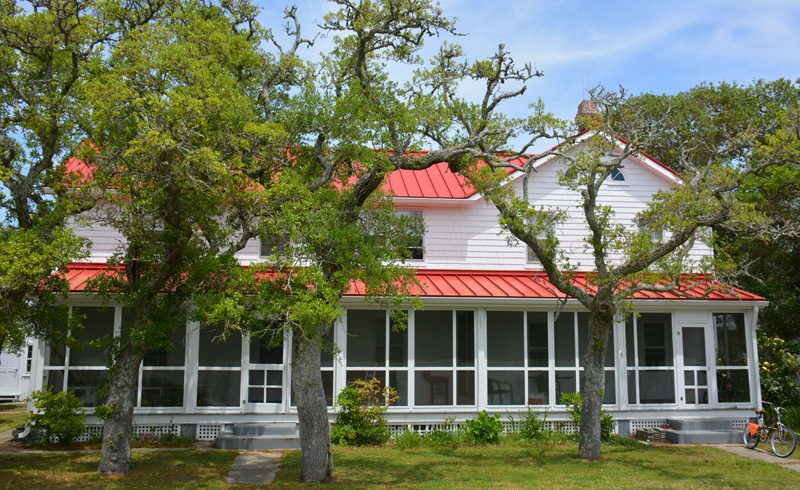 There are a number of bed &breakfasts and charming hotels that can be in the shadow of the Ocracoke Island lighthouse. Visitors can also rent weekly vacation homes and condos through area property management companies. There are also two campgrounds that are close by, which are located in central Ocracoke village. Are there tours of the Ocracoke Island Lighthouse? There are limited interior or exterior tours of the Ocracoke Island Lighthouse, as the inside of the lighthouse is traditionally not open to the public. There are, however, seasonal lighthouse talks and / or other programs hosted by the National Park Service in the summer months, which are held at the Ocracoke Island Visitors Center on the edge of Silver Lake Harbor. Why is the Ocracoke Lighthouse so short? The purpose of the current Ocracoke Lighthouse - as well as its predecessor, the 1794 Shell Castle Island Lighthouse – was to provide guidance to mariners travelling through the adjacent Ocracoke Inlet and Pamlico Sound. Because the range of light did not have to be very far, the lighthouses were significantly shorter than other Outer Banks lighthouses that had to be seen from the treacherous and offshore Graveyard of the Atlantic waters. Is the Ocracoke Island Lighthouse lit? The Ocracoke Island lighthouse is lit with an original fourth-order Fresnel lens, which was installed in the lighthouse in 1854. It was dismantled during the Civil War by Confederate troops, but was re-activated by Union forces in 1864. Does the Ocracoke Island Lighthouse rotate? The light at the Ocracoke Island Lighthouse is a fixed light, and does not flash or rotate. How far away can you see the Ocracoke Island Lighthouse light? On a clear day, the light of the Ocracoke Island Lighthouse can be seen from roughly 15 miles away. The white lighthouse itself is visible throughout the four-square mile Ocracoke village. What kind of light does the Ocracoke Island Lighthouse have? The Ocracoke Island Lighthouse has a 4th order Fresnel lens, which is equal to 8,000 candlepower, and which was installed 1854. Is there an Ocracoke Island Lighthouse museum? The Ocracoke Island Lighthouse does not have a museum or gift shop on site, however, visitors will find a wealth of information on the structure at nearby points of interest, including the Ocracoke Preservation Society Museum and the Ocracoke Island Visitors Center. 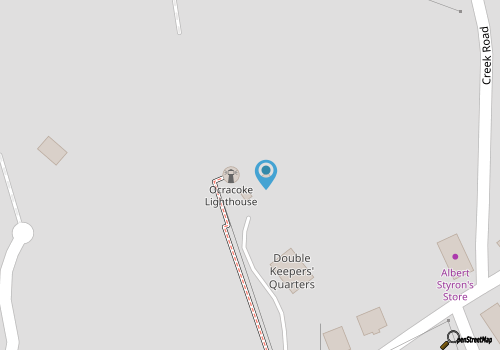 Where can you eat near the Ocracoke Island Lighthouse? While the road where the lighthouse is located is a relatively quiet and residential street, the lighthouse is nevertheless close to more than a dozen restaurants that border NC Highway 12 and Ocracoke Harbor. Does the Ocracoke Island Lighthouse have a gift shop? There is no gift shop adjacent to the Ocracoke Island Lighthouse, however many of the area’s unique stores and boutiques have lighthouse memorabilia of all varieties – from framed pictures and photos, to holiday ornaments. Are there any restrooms at the Ocracoke Island Lighthouse? There are no public restrooms at the site of the Ocracoke Island Lighthouse. Restrooms are available at public facilities and landmarks in Ocracoke village, such as the Ocracoke Island Visitors Center.